Most of the people who are overweight or having obesity are under risks to develop heart diseases like myocardial infraction,strokes. Overweight puts more strain on heart.Obesity means there is possibilities to raise blood pressure,cholesterol and blood sugar. So losing weight is the best treatment to reduce risk of heart diseases and blood sugar. 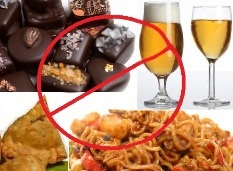 -Say 'no' to highly processed foods like noodles,chips,sweet,pastries,very oily snacks.Replace these foods with which are considerably lower in calories and rich with essential minerals (like calcium,magnesium,iron) vitamins,fiber . -You should eat few light meals instead of one heavy meal.But remember you should not skip meal. Calorie cutting is a way to lose weight quickly. --If you are taking alcohol in regular basis,then limit high calorie drinks .Because alcohol stores carbohydrate (sugar) and fat on your body instead of getting used as fuel. -Just remember if you eat more calories than you burn you will gain weight.So obviously if you burn more calories than you eat you will lose weight. -So when you know how many calorie you have to consume and how many calorie you have to burn then it will easy to understand how to lose weight by calorie cutting. Cholesterol is nothing but waxy like substance made in the liver and tissues of animals.So it is found in animals products not in plant sourced food.So avoid ghee,cheese,meat and all other animal products if you are really serious about your weight.